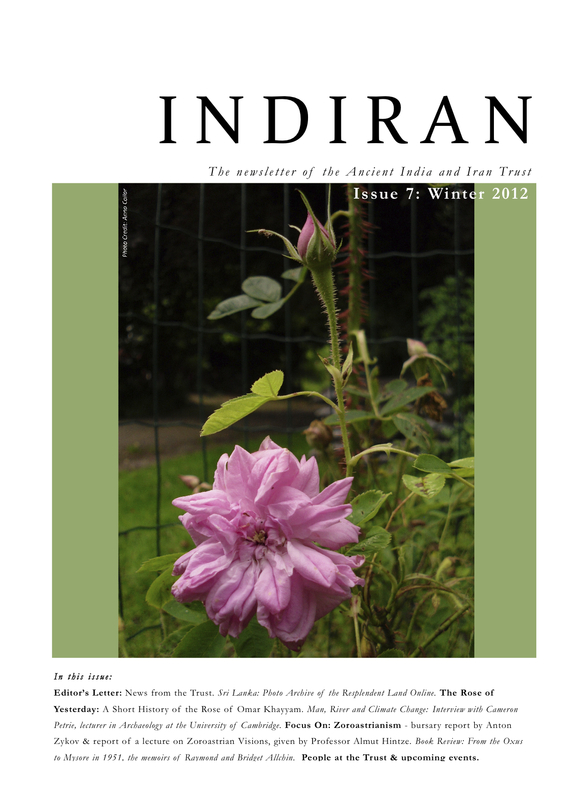 The latest issue (no 7) of Indiran, the newsletter of the Ancient India and Iran Trust in Cambridge, contains an article by the Trust’s administrator Dr Anna Collar entitled The Rose of Yesterday. A Short History of the Rose of Omar Khayyam. In the article, she outlines the links between the Persian poet/astronomer and one or more roses and the way the story of their association has developed and been embellished over the years. A rose with the name Omar Khayyam is now sold in the UK by Peter Beales Roses, and an example of this, given by Bill Martin and Sandra Mason, has been planted in the Trust’s garden to commemorate the Rubaiyat and FitzGerald anniversaries of 2009. To read the full article see http://indiairantrust.files.wordpress.com/2013/03/downsized-indiran.pdf . Don’t be put off by the download time. This is a big file but the contents of the newsletter are well worth looking at. Thank you for this, what a gem to come across, I’d been looking for further information on this subject. A gem of an article if you are a lover of Omar Khayyam and roses.